Soy sauce dominates a little too heavily in this sauce, drowning out the layers of flavor that sit beyond it, leaving a sauce that's out of balance and overpowering. Wild Thymes began when Enid Stettner bought the farm, literally. After passing a beautiful farm in the Hudson Valley, New York, Enid and her husband bought it in 1961. After years of spending weekends in their update escape from New York City, the couple moved there in 1970 and Enid began honing her cooking skills in the decade that followed. She then started up Wild Thymes in the 1980's with a line of herb and fruit vinegars that became a success. 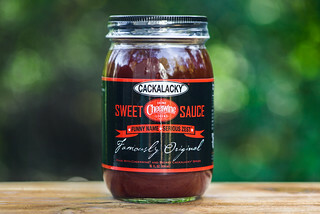 In the 1990's, Enid's daughter Ann and her husband, Neil, joined the family business and together they worked on new recipes and expanded their product line to include chutneys, dipping sauces, marinades, vinaigrettes, cranberry sauces, and six different barbecue sauces. 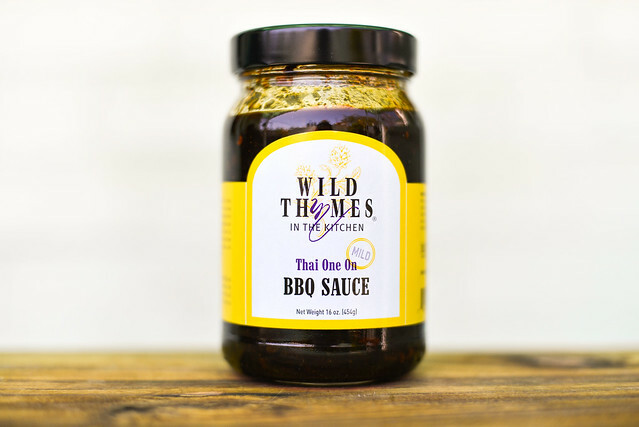 The aroma of Thai One On is heavily comprised of a sweet soy sauce. That deep fermented bean smell is so dominate that that it masks most else. On a deeper smell you can make out an equal mix of onion and garlic, and just beyond that is a light tomato fruitiness. This dark brown sauce is heavily textured with what I assume are chunks of garlic and onion. Beyond those seasonings, not much else can be seen in the spice department, likely due to its dark color. The sauce has a medium consistency, but the large bits of veggies make it feel thicker than it actually is. It has a chunky pour from a spoon, falling off fast in uneven globs, leaving only a thin coating left clinging to the spoon. The salty, fermented flavor of soy sauce is incredibly heavy out of the gate. As the sauce settles on the tongue, a sharp vinegar tanginess combines with the soy sauce and stays there until the end. These two ingredients are so omnipresent that the large chunks of onion and garlic struggle to make themselves known beyond the texture that they add, and further background flavors of tomato, lime, and coconut are almost completely washed out. A bit of heat comes out as the sauce leaves the tongue and mixes with the vinegar and soy to create a slight salty and tangy burn. The sauce coated the chicken leg well, baking in nicely over indirect heat, and caramelizing without burning over direct heat. 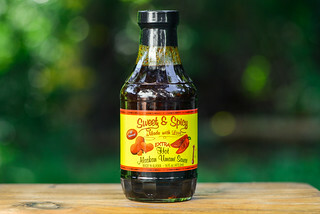 Vinegar and soy were still the heavy hitters, but they found a nicer balance with a sugar that scaled back their harshness from out of the jar. 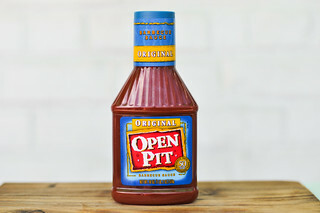 This gave it a character more in line with barbecue sauces, if the base of those sauces were soy and not tomato. While you got the tanginess and sweetness with some spice in the way of garlic, onion, and chilies, the soy was still pretty overpowering. I love Thai food and bought this sauce based on it's name, but unfortunately little to no Thai influence was to be found. 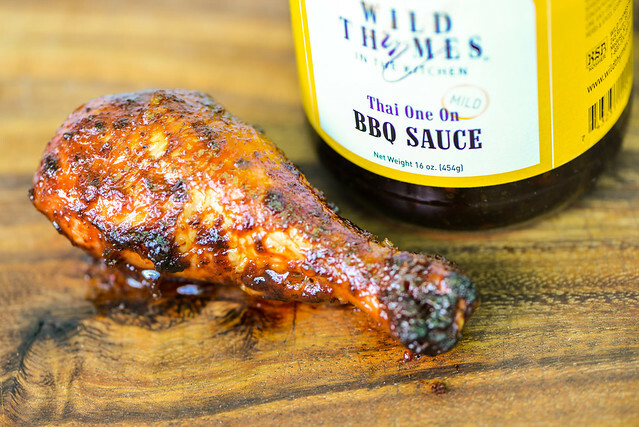 Instead this sauce tried to build on a barbecue sauce base with the addition of soy sauce, which knocked out other ingredients with its strong flavor. Ultimately this made the sauce too off balance, and while it was a little better after being cooked thanks to some extra sweetness being coaxed out, I still wouldn't say it delivered the layers of flavor of a really good barbecue sauce. 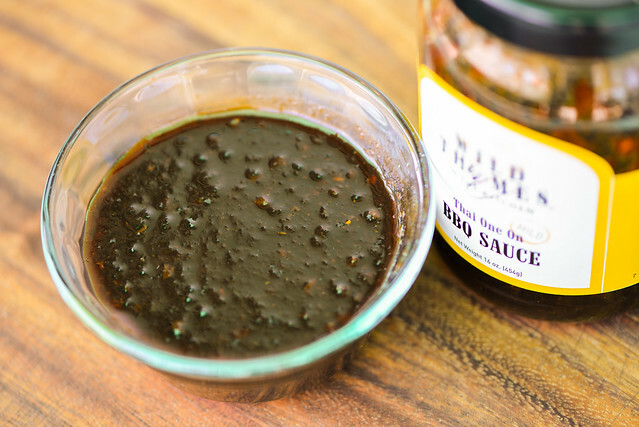 I had high hopes for this Asian-influenced barbecue sauce, but it left me a little disillusioned and wondering what I would want to put this on.